Value & RankThe Central bank discount rate of Pakistan is 12.0 (%) with a global rank of 14. 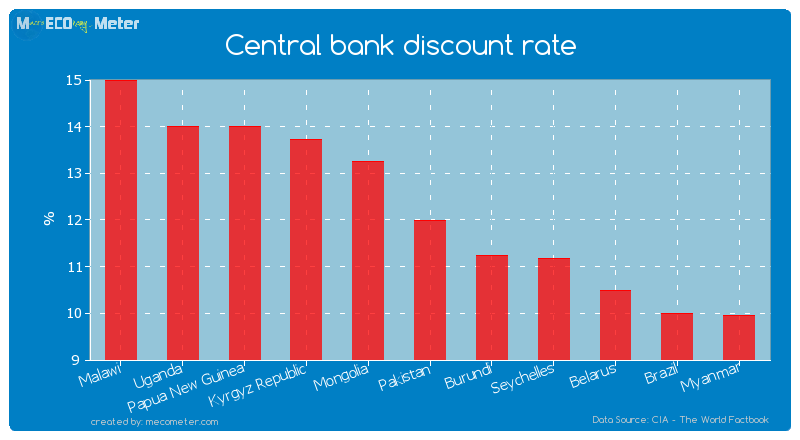 Pakistan compared to other CountriesThe Central bank discount rate of Pakistan is similar to that of Malawi, Uganda, Papua New Guinea, Kyrgyz Republic, Mongolia, Burundi, Seychelles, Belarus, Brazil, Myanmar with a respective Central bank discount rate of 15.0, 14.0, 14.0, 13.7, 13.3, 11.3, 11.2, 10.5, 10.0, 10.0 (%) and a global rank of 9, 10, 11, 12, 13, 15, 16, 17, 18, 19.Last 5 years averagePakistan had an average Central bank discount rate of 10.6 (%) in the last 5 years from (2007 to 2012). Value & RankThe Commercial bank prime lending rate of Pakistan is 11.5 (%) with a global rank of 68. 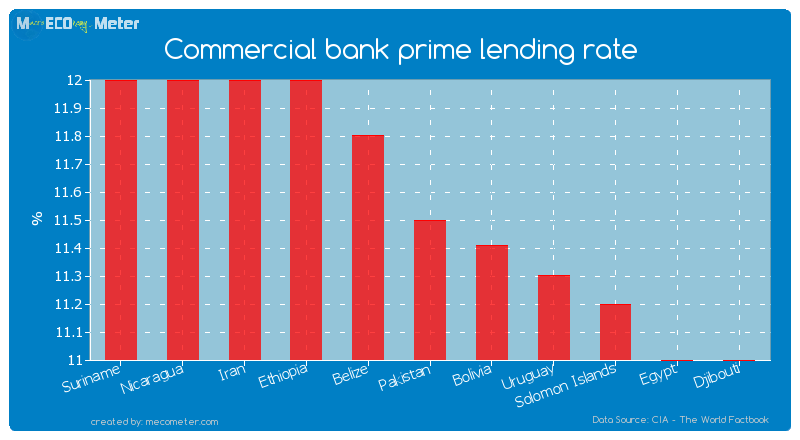 Pakistan compared to other CountriesThe Commercial bank prime lending rate of Pakistan is similar to that of Suriname, Nicaragua, Iran, Ethiopia, Belize, Bolivia, Uruguay, Solomon Islands, Egypt, Djibouti with a respective Commercial bank prime lending rate of 12.0, 12.0, 12.0, 12.0, 11.8, 11.4, 11.3, 11.2, 11.0, 11.0 (%) and a global rank of 63, 64, 65, 66, 67, 69, 70, 71, 72, 73.Last 4 years averagePakistan had an average Commercial bank prime lending rate of 11.0 (%) in the last 4 years from (2009 to 2013).